Place cream, milk and instant coffee granules in a small saucepan. Add cinnamon stick and sugar. Stir over medium-low heat until mixture comes to a gradual boil. Remove from heat and add vanilla essence. Stir gelatin into hot water and mix until dissolved. Add dissolved gelatin to the coffee cream mixture. Pour mixture through a fine sieve strainer into individual moulds, and cover each mould with cling-film wrap. Leave in the refrigerator to set and chill overnight. To serve, run a blunt knife or spatula around the rim of each mould, then place the moulds in warm water for 10 seconds. 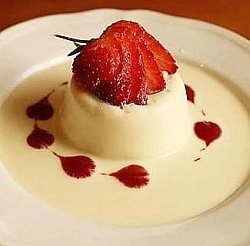 Unmould panna cotta into a serving dish and serve immediately.